If AIG’s latest request for more bailout billions wasn’t the frosting on the cake, I’ll take the cake and eat it too. I’m referring here to Hazel Henderson’s famous economic cake that clarifies what now gets left out of the economy. You and me and our mother earth. My pages about Gaia and Eros parallel what Hazel calls the “non-monetized” half of the economy, her two bottom layers. Without them, whatever you call them, Eros or the Love Economy, Gaia or Earth, we’d all be pretty flat. You’ll also see the monetized filling, the “underground economy,” so necessary to the addictions Barbara Brandt talks about in Whole Life Economics. 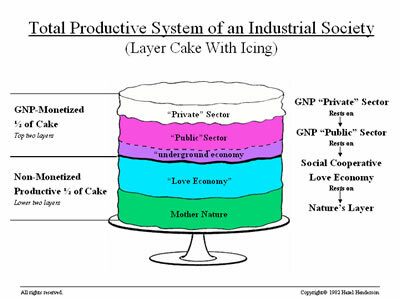 What tops our present economic cake, of course, is that “private sector,” the folks who get all the frosting. Lately they’ve been helping themselves to the “public sector’s” bowl of batter too. But neither sector could sweeten a thing without the non-monetized work “the rest of us” do. Now that the bailout is jumping out of the cake, buck-naked, (see more on this below) let’s hope this overblown economic party is close to being over. What we need is a designated driver. Plus all of us should get a lick from that frosting spoon. « A $700 Billion Bailout–But Every Year?